A huge solar power plant, the 8th-largest in the world, was just inaugurated in California over the weekend. The Catalina Solar PV plant is actually owned by the French energy company EDF Renewable Energy. The giant solar PV power plant includes 1.1 million solar panels on 900 acres in Kern County, California. The projection is that the 143 MW solar PV power plant will produce enough electricity for 35,000 homes. About half of the power plant (82 MW) is composed of Solar Frontier solar modules, while the remainder (61 MW) is composed of First Solar modules. Aside from owning the project, EDF Renewable Energy will also operate and maintain it. The large solar power plant is a story all its own. However, the broader story is just how competitive solar PV power has become. Just two years ago, this solar power plant would have been the largest solar power plant in the world. However, with solar power becoming so competitive in the US and around the world, it is barely in the top 10 and will probably soon be knocked out of the top 10. 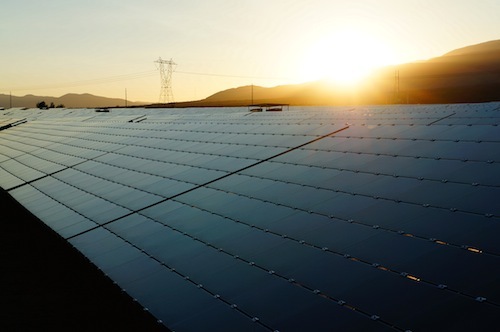 San Diego Gas & Electric (SDG&E) has signed a 25-year power purchase agreement (PPA) to buy electricity from the solar project. The wonderful thing about solar power is that the common person can benefit from it. While large corporations like EDF Renewable Energy and SDG&E are benefiting from the positive economics of clean energy, common householders and small business owners can do the same by putting solar panels on their roofs. The savings are there for millions and millions of people to have.